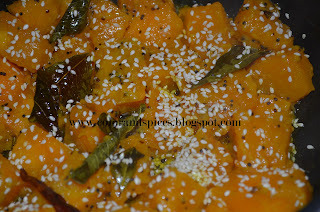 Kumro (pumpkin) is a very common vegetable in Bengali kitchen. No we don’t carve them to a jack-o-lantern, but eat them. Even the flowers of pumpkin (kumro phool) and the soft young leaves (kumro saag) are also eaten with great pleasure. Pumpkin can be cooked in various ways; be it simple batter fried (bason diye bhaja), or some mixed vegetable mish-mash (chochhori), or a non-veg dish (with hilsha fish head). Here in the US, we get pumpkin regularly in the market, but unfortunately miss the kumro-phool bhaja (pumpkin flower) and kumro saag (leafy part of pumpkin). In Kolkata, my home town the ripe pumpkins are sweet and red-orange in color, here I need to add sugar to my pumpkin preparations. 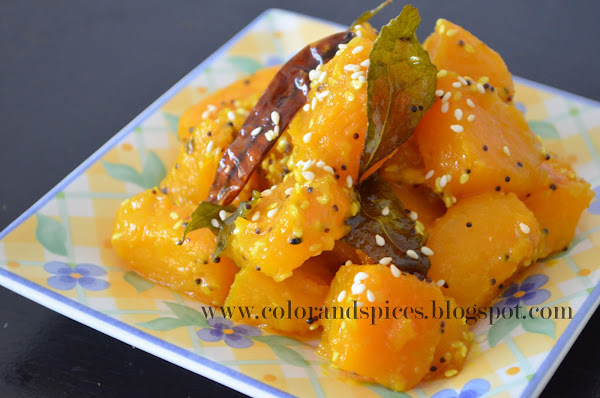 Today I have made some simple fried pumpkin with sesame seeds, flavored with curry leaves and hing (asafoetida). It is a very easy, quick and tasty side dish to go with rice and dal (lentils). 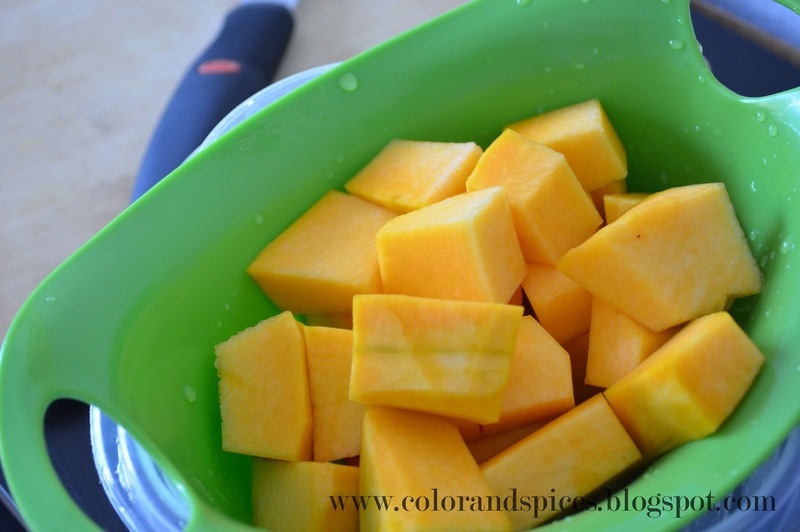 1.Wash and peel the pumpkin and cut into cubes. 2.Add oil in a pan. I used canola oil. You can use any other oil, like mustard or oilve or any vegetable oil. 3.As the oil is hot reduce the heat and add curry leaves, black mustard seeds, red chili and a pinch of hing. 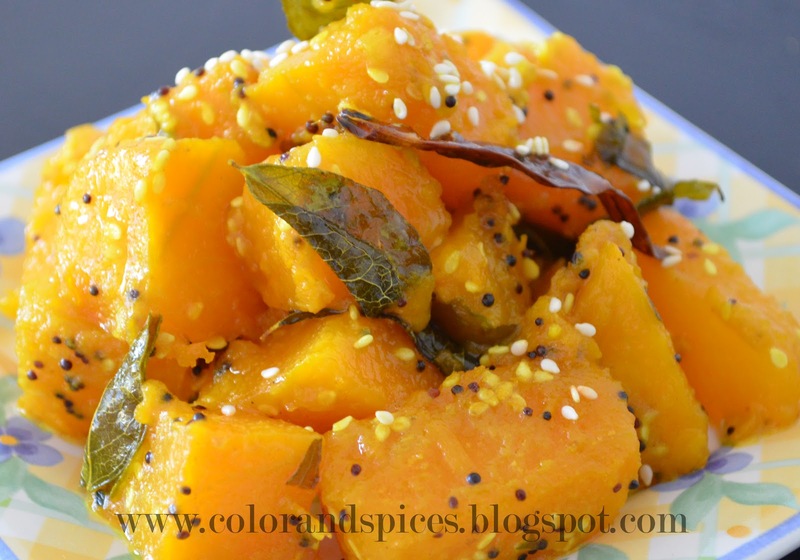 4.As the mustard seeds spatter add the pumpkins. Add salt and turmeric powder. Add grated ginger. Mix well. 5.Cook till the pumpkins are cooked, but take care the pumpkins should not become mushy. Add sugar. Check the seasoning and adjust accordingly. 6. 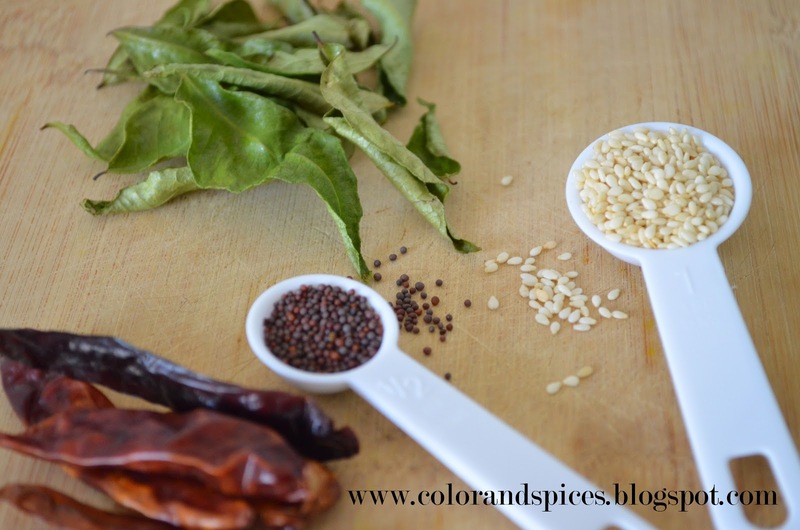 Add the sesame seeds. Cook for 1-2 min in high flame. Serve it with some steaming hot rice and a bowl of musur/masoor dal(red lentils). I made this following your recipe..really nice. 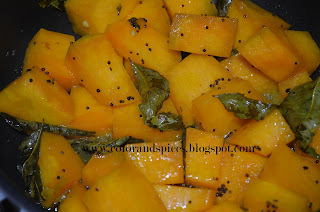 The smell of curry leaves and sweetness of pumpkin blended well.